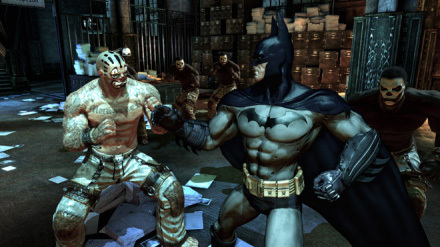 Demo Impressions: Batman: Arkham Asylum - This Is My Joystick! Batman is one of the most loved superheroes of all-time (not a patch on the all conquering Spider-man though… and no, that’s not opinion, that’s factual), but the caped crusader hasn’t had the greatest history in the games industry (although not quite as bad as Superman’s). His digital past has been littered with an odd mixture of average platformers and lacklustre side-scrolling beat em up’s, however since the dark and broody screens and trailers started being rolled out from Eidos HQ, I can’t think of one person I know that isn’t excited for Rocksteady Studios upcoming Batman: Arkham Asylum. After I first witnessed some gameplay footage, I have to admit that as excited as I was, I was left with a doubt about just how fluid it would be to control Mr ‘Daddy issues’. The much-anticipated demo finally dropped today on Xbox Live and PSN, and I made sure I took time to give the 360 version a spin. The opening of the demo sets the scene almost perfectly, as rain batters down from a bleak Gotham sky. The camera moves to the right revealing the majesty of the infamous Bat-signal projected onto one of the offending rain clouds. The camera continues to pan down to street level with emergency services rushing in one direction, as the Batmobile heads in the other. Inside Batman stares sternly ahead, as his passenger, the Joker, babbles incoherently to himself. Once arriving at Arkham, a certain Jim Gordon is awaiting to oversee the Joker’s safe passage into his new home, totally unaware that Harley Quinn is in charge of security. Joker makes his move, taking out his accompanying guards, leaving Harley to open the passage deep into the asylum. What ensues next is a deadly game of cat and mouse, as Batman has to chase his most dangerous foe down. It’s at this point after taking in the above you realise that Rocksteady are huge fans of the character; everything about the tone and presentation is all that die-hard Batman fans have been looking for. Graphics all round seem very impressive; the characters are extremely well modelled, however one of the most impressively modelled characters is Arkham Asylum itself. The dark and gothic environments tell their own story of mental torture and twisted inhabitants. The inclusion of long time Batman voice talent Kevin Conroy and Mark Hamill also goes a long way to add to what already seems a generally high quality of voice-acting. That said; can they get the other aspects of Batman done just as right? Thankfully the answer is ‘yes’ it seems, going by this bite-size chunk. From the moment the Joker makes his escape deep into the heart of Arkham you are instantly thrust into the action, faced with three thugs as you learn the basics of combat. Most of the combat is done through the X button, but you are able to do combos by mixing it up with some of the other buttons once an attack has been started. Counters are nice and easy; when you press Y and Batman readies to deflect an attack, and if an enemy tries to hit you in this stance in time, ‘Bats’ blocks and unleashes a barrage of his own. Once an enemy is down temporarily you can use the short time frame to make sure they don’t get back up by doing a floor take down using right trigger and Y. The system is sort of reminiscent to that found in Assassins Creed, although far less reliant on the counters. When the last enemy goes down the action takes place in slow motion and gives a satisfactory end to battle. I have to say that combat is amazingly fluid, and the fight animation is spot on. I didn’t see one drop in animation in transition, and there are a vast amount of movements, blocks and attacks. Batman’s cape moves stylishly, giving combat and other movements a real comic book feel. It’s here where my fears about the possibility of clunky controls were completely allayed, although I must admit that it all seemed a little easy, but thankfully different challenges lay further ahead. Following the battle tutorial, and learning how to use the Batterang (left trigger to aim, right trigger to fire) you are tasked with taking out serial killer Mr Zsasz who is dishing out some electroshock therapy on an unwitting guard; you have to get to him without being seen or he’ll fry his captive. It’s clear you need to tackle this from above, and as you head upstairs the detective mode is explained. This allows you to see enemy positions through walls and have key parts of scenery pointed out. It’s here you are also treated to the grapple hook system. A simple look in the direction of a gargoyle and a press of the right button you grapple and swing to it. It’s really that simple. From on top of a gargoyle you can do a number of things; jump and glide down, drop silently to the floor behind your foe, do a glide kick at the enemy you are looking at, or even hang upside down enabling you to swiftly grab an enemy and leave him dangling. The only real option you have with Mr Zsasz is to glide kick, which is extremely satisfying to perform. From here you are faced with three armed guards who you must get the drop on stealthily in a similar manner, although sneaking up and disabling them from behind one at a time. The last section of the demo sees a wide open room with five armed enemies patrolling. Here you must use all the skills you’ve just learnt to disable them, but this is far trickier than before. Get spotted and their assault rifles will swiftly zap away at your health bar. Once these guys are cleaned up, thus ends the demo. Not before teasing with one last cut-scene, featuring the joker releasing some kind of mutant, leaving you at a point wanting more, which is a sign of a good demo. So is it looking promising? I think so, although I must admit that concerns over the controls no longer exist, in their place I just worry about how long the combat can stay fun considering how easy it is, and whether a lot of the gameplay makeup will simply turn out to be a gargoyle-fest. Despite those fears it’s definitely got a lot of quality, and has now become a must buy for me. Final judgement, as always, will be reserved for the final product, and you can expect our review around the time the game releases on the 28th August.